Unlike perfumes and colognes, there is an art to wearing natural fragrances. Ambre Blends Oil Essences are designed to complement your body’s natural chemistry so that every time you apply our products, your body emanates a soothing, long-lasting aroma unique to you. Our organic infusions are activated by your body’s warmth, uncovering a unique adventure every time you blend with our empowering essences. Wearing, sharing and exploring Ambre Blends is easy, intuitive and a work of art. It is important to note these three essential steps to best wear and emanate the soothing, natural fragrances of Ambre Blends. Apply. 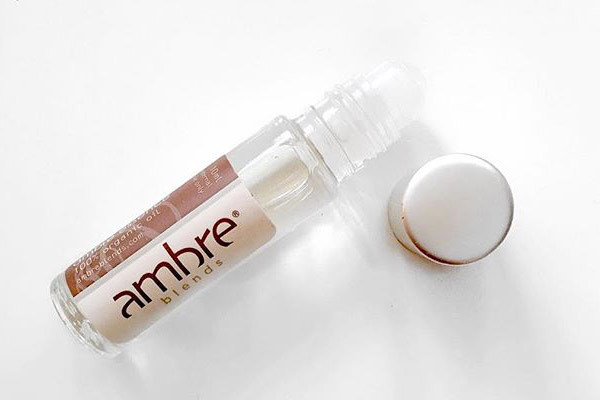 It can be difficult to smell the essence in Ambre Blends products while they are still in the packaging. To get a true sense of our fragrances, generously apply the product by rubbing it on to your forearms and other “hot spots” such as the nape of the neck and chest. Radiate. Ambre Blends pure, natural fragrance will come alive once it blends with your body’s warmth and chemistry. Give the essence time to work with your body heat. Our fragrance will radiate after the product has had time to blend with you. There is no need to reapply, the essence will continue to radiate as you cool down and warm up throughout the day. Time. Over time, like wine, your oil essence will get better. It is also important to remember that after repeated use of our natural fragrances, it is completely normal for your sense of smell to become accustomed to your unique Ambre Blends scent. Alternating between our signature fragrances can help prevent scent immunity over time. Through exploring each of our essences, those around you will still be able to recognize your individual scent and your sense of smell will remain uncompromised. Mix our signature scents to discover your perfect fragrance that is uniquely yours! You can find out more about our four signature scents here.